Posted on July 11, 2013 by dan reed! BF Saul proposes a pedestrian plaza along the west side of Rockville Pike. After public outcry over their earlier proposal, developer BF Saul is back with a new design for a mixed-use complex that will replace the Metro Pike Center shopping center and Staples at the intersection of Rockville Pike and Nicholson Lane. Over 60 people came to the monthly White Flint Implementation Advisory Committee meeting at the Shriver Aquatic Center to see it, though concerns remain about how the pedestrian-friendly the new buildings will be. The Bethesda-based developer first revealed their plans to build 5 towers containing 1.4 million square feet of housing and 200,000 square feet of office and retail space on the combined 12-acre site in May. Residents complained that there was little street-level retail, discouraging people from walking around. This time, however, 4 of the 5 towers will have ground-floor shops and restaurants, putting it along both sides of Rockville Pike and parts of Marinelli Road and Nicholson Lane. The developers hope this will create more sidewalk activity. 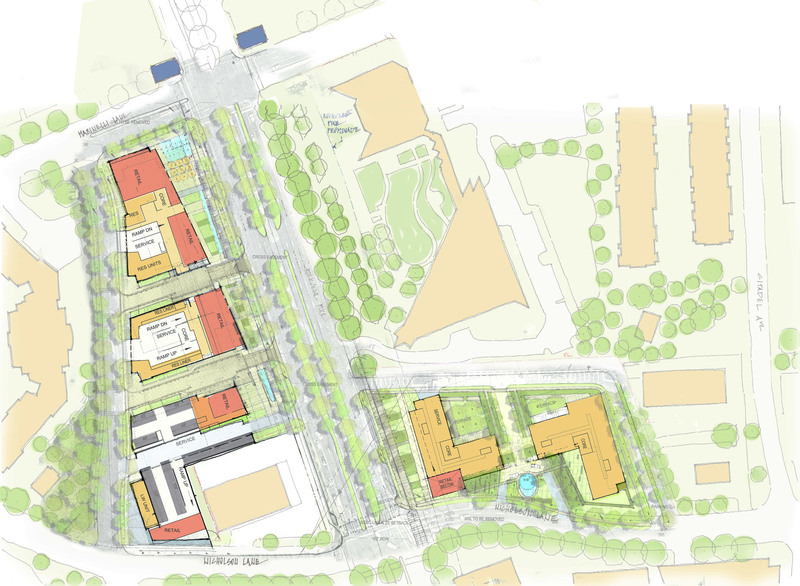 Site plan of BF Saul’s proposal to replace Metro Pike Center with 5 mixed-use towers. BF Saul proposes creating a grand promenade along the west side of Rockville Pike, complimenting a linear park on the east side above the Red Line, which runs so close to the surface that buildings can’t be built directly above it. It will contain a plaza with fountains, gardens, trees, benches for sitting and gathering, and outdoor seating for restaurants. The promenade will have an “active, lively urbane” feel, “attracting people to come and encouraging them to linger,” says Michael Vergason, landscape architect. It will get wider closer to the Metro, taking advantage of a high point on Rockville Pike with long views. Beyond the plaza will be 2 300-foot residential towers closer to the White Flint Metro station that share underground parking. A third, 200-foot office tower closer to Nicholson Lane will sit atop a “podium” of parking that will make it appear taller. In keeping with the White Flint Sector Plan’s call for a new street grid, BF Saul will extend Woodglen Drive north from Nicholson to Marinelli, with 2 smaller streets linking it to Rockville Pike. Woodglen will be lined with street trees and apartments with “real doors,” giving it a quiet, residential feel while masking the above-ground parking garages. “There are going to be steps and stoops and pots and plants to make Woodglen a nice residential street,” says Daniel Ashtary, architect with Silver Spring-based Torti Gallas and Partners, who is also designing the Gables development next to Wall Park. On the east side, there will be 2 residential towers measuring 300 and 240 feet tall with underground parking surrounding a shared driveway. A new street will run behind them, connecting the Pike to Citadel Avenue. Residents had many questions about traffic, pedestrian safety, and the need for larger, family-sized apartments in the area. One man asked if current businesses, like Staples and Kinko’s, will be able to come back after the shopping center is demolished. 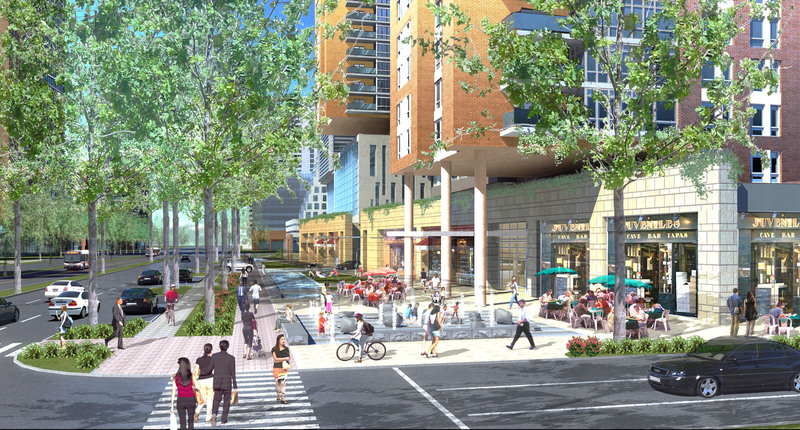 Neighboring property owners expressed concerns about the extension of Woodglen Drive, which would connect this project to JBG’s North Bethesda Market to the south and Federal Realty’s Pike + Rose to the north. “It’s a really important street,” added Evan Goldman of Federal Realty. “I’d like to see some focus on that.” He recommended that BF Saul work with the Grand Apartments, which is directly behind their project, to nudge Woodglen to the west so it could connect with streets in Pike + Rose. Greg Trimmer of JBG suggested making the promenade a little narrower and giving the extra width to Woodglen so it could accommodate wider bike lanes or sidewalks. This would also make the promenade more attractive to retailers. In downtown Silver Spring, there’s no shortage of empty retail spaces behind gorgeous pocket parks, simply because the distance from the street discourages pedestrians from walking over. However, the new design has promise, and it’ll be exciting to see how it continues to evolve. Downie says the “market will dictate” when construction begins. BF Saul will file a sketch plan with the Montgomery County Planning Board later this summer; if the approval process goes smoothly, construction could begin within 2 years, and the first building could open within 5 years. This entry was posted in New Urbanism, Uncategorized and tagged BF Saul, metro pike center, North Bethesda Market, Pike & Rose, Rockville Pike, Urban Design. Bookmark the permalink.